Markets are down over 1% with the Dow down 150 points. We got the pullback that we were waiting for down to the 100 day moving average (purple line) but, we pierced that as well and are now holding on to the 150 day (blue line) just underneath the 100. Apparently the market did not like the fact that Europe is saying individual countries with fiscal problems must manage those problems on their own, leading investors to believe that another bailout is not imminent. That’s what the bulls have been hanging their hats on all summer: further easing from central banks. The bears know this and along with the combination of slowing growth, believe the markets have no where else to go but down. At the end of the day stocks are cheap, and interest rates are so low that you cannot get a return for your money anywhere else. That’s what we feel is keeping a bid under the market. But we at wallstreetstocksolutions understand this disconnect and cannot be biased in either direction. No matter how smart you think you are, the market is always smarter. The situation in the market right now is a tug of war between traders, proving why the market has been in a volatile trading range for the last 3 months. As a result, we are still in 85% cash, waiting for a direction, and will only pick away at our core holdings at the disciplined- low end of the trading range- buy points. Same story as usual. If we hold the 150 or 100 today, we might have something to talk about tomorrow. If we hold, we might add to one of our holdings at the end of today- always buy at the end of the day. Further updates to follow at 2:30. Update: 1:45 Adding to UPRO with dow down 130 points. 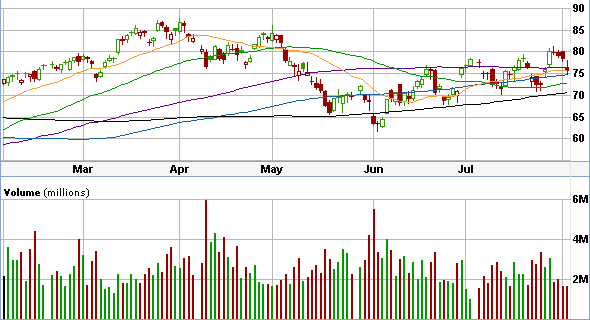 A stop is in below the 150 day ($74.75). Market is down 4th straight day and is at our buy point. No sense in setting strike prices if you don’t honor them. We are being prudent, buying on the dip, but keeping a stop- loss below it. Have a good evening.